The 10 Best Festivals in West Virginia! West Virginians are always finding ways to celebrate life, whether it's by commemorating the unique ethnic origins represented in the state, being thankful for a plentiful harvest, enjoying creative expression through music and the arts, or just promoting this amazing state. It's hard to narrow down the 10 best festivals in West Virginia, but the ones listed below have been ranked high by previous visitors. Wherever you choose to go and whatever you're celebrating, you won't be disappointed. Over the past 39 years, this little festival has grown to be one of the largest in the state. The Italian Heritage Festival, held in Clarksburg, West Virginia, has won the prestigious "Top 100 Events in North America" award by the American Business Association several years in a row and attracts over 100,000 visitors to the area. You can find delicious street food and entertainment and children will enjoy the carnival midway area featuring rides and games. Past performers have included Tony Danza, Frankie Avalon, and Jo Dee Messina. If you love all things apple, then the Mountain State Apple Harvest Festival in Martinsburg, West Virginia, is the festival for you. Featuring apple pie judging, a reception and ball, Apple Growers Contest, square dancing, pancake breakfasts, parade, and a 5K Apple Trample Run, you'll find everything you need to satisfy your apple itch. There is an arts and craft fair and an antique car show, and you won't want to miss the Baby Appleseed Contest. Are you ready to be part of one of the best literal foot-stomping festivals around? Then you have to visit the Grape Stomping Wine Festival in Kirkwood, West Virginia. This annual event has been going on for 25 years at Kirkwood Winery and provides two days of bluegrass music, covered wagon rides, dance, wine tasting, and of course, a chance to stomp the grapes. Door prizes are drawn daily, tours of the distillery are offered, and food is available in abundance. Not a formal festival, but nonetheless a celebration that draws literally thousands of people, Bridge Day in Fayetteville, West Virginia, is worth mentioning. Considered one of the largest extreme sports events in the world, this two-day event includes bus rides down into the New River Gorge, a 5K race, car show, bridge-jumping stunt demonstrations, a chili cook-off, live music, and food vendors galore. You can walk the 24-inch catwalk over the second largest single-span arch bridge in the Western Hemisphere, or if you're feeling brave, you can jump or rappel down into the Gorge. Featuring family-friendly events and exhibits, the Strawberry Festival in Buckhannon, West Virginia, is a unique celebration of the strawberry harvest. This free eight-day-long festival provides fun for everyone with a parade, arts and crafts shows, and food vendors offering delicious strawberry delights. There's also a band competition, a 5K Strawberry Run, Diaper Derby, Canoe Race, and Road Bowling. The mission of the State Fair of West Virginia in Lewisburg, West Virginia, is to promote local agriculture, family-centered entertainment, and provide educational opportunities that strengthen community. The first state fair was held in 1874 and the tradition that has been carried on all these years now includes 10 days of events, contests and competitions, entertainment, and fun. Camping is available nearby, but fills up quickly, so make sure to make reservations early. Another unique festival, the Wanderlust Festival in Snowshoe, West Virginia, is a celebration of mindfulness. 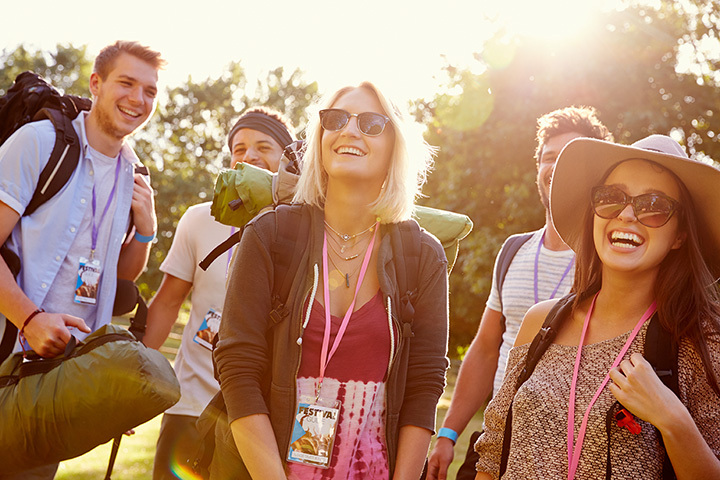 Wanderlust festivals are held all over the country at mountain resorts and include yoga and meditation instructors, musicians, special motivational speakers, and culinary experts who will challenge and inspire attendees to transformation through positive thought and action. This three-day event at the beautiful Snowshoe Lodge offers attendees a chance to choose guided adventures, sample delicious food, hear local music, and just unwind from their daily routines and recharge. Combining dance, family fun, music, theater, visual arts, and other events in this week-long festival, the FestivALL in Charleston, West Virginia truly has it all! National and international artists along with local talent present the best of the best with more than 60 arts and community organizations in this city-wide program. Surprises abound on every street corner as you stroll through this amazingly diverse event that promotes creativity at its best. This four-day outdoor festival features the best of the best in traditional bluegrass music and has been for 37 years. Part of a national series of events to promote this unique form of music, Music in the Mountains in Summersville, West Virginia, features favorites like Rhonda Vincent, Doyle Lawson, and Goldwing Express. Seating is on a first-come basis, so come early and stay late. Yes, you read that right. One of the most unique festivals in the state is the International Water Tasting Festival in Berkeley Springs, West Virginia. This award-winning competition is held annually and involves more than 100 participants from across the world to determine who has the best tasting tap, bottled, and purified water. The festival has been featured on National Public Radio, BBC, MSMBC, and Fox News to mention just a few places. Attendees get to vote for their favorite and choose the recipient of the People's Choice Award. View more West Virginia Festivals, Fairs and Parades.